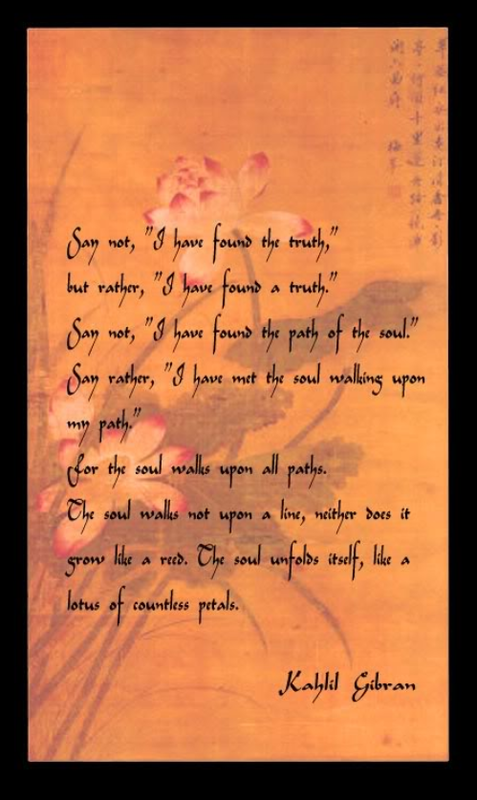 This entry was posted in Today's Quote and tagged Gibran, Kahlil Gibran, soul. Bookmark the permalink. I may never know the truth but that doesn”:t mean I don”t keep trying. We’re on that same road – the trying and the seeking! I find the truth will show up when its ready…you can’t find it. Interesting! I think sometimes it’s already there and we either don’t see it or aren’t ready for it. Thank you for stopping by and commenting. So true, sometimes it right in front of us, we just don’t see it…Maybe because we are not ready for it. BEAUTIFUL truths! I loved it through in through ! As always, Debbie, my thanks. I am glad you liked this! I am always hopeful that something that touches me may touch someone else, too.